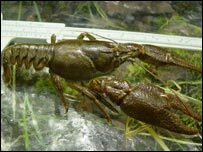 Britain's only native crayfish which was feared extinct in Essex has made a comeback. Essex Biodiversity Action Plan environmentalists have discovered a colony of white-clawed crayfish thriving in the River Chelmer. The survey found 18 of the crustaceans from mature crayfish to babies. The species has been wiped out in many parts of the country by the non-native larger American signal crayfish with whom they have to compete for food. Project officer Mark Iley said: "It's the only site in Essex where we know that we have these white-clawed crayfish." The crayfish play an important role in the aquatic food web, providing a food source for a variety of animals such as fish, birds and mammals such as the otter. They like clean water and shelter in crevices under submerged stones, tree roots and plants. "We will be improving their habitat by putting in rocks and wire baskets to provide a refuge for them. "It's good that we have got a positive site but we now have to protect it," said Mr Iley. In addition to displacing the native crayfish, the signal crayfish also carry a plague, a fungal disease that is deadly to British animals.